Your Subconscious Mind Holds the Key to Improving Your Computer Sessions and Therefore Improving Your Health and Wellbeing! Computers can often make life a lot easier, but they can also end up doing a lot of damage to our bodies: for example, eye strain, body soreness, cramps, and clots. Many people who work with computers regularly, are often so focused on work or being productive, that they don’t remember to prevent damage to their bodies. With our Improve Computer Sessions Hypnosis MP3, you can naturally and effectively counteract the ill-effects of regular computer use. Now, you can make all these great counteractions a natural habit with our Improve Computer Sessions Hypnosis MP3 session. Steve G. Jones, Ed.D., Clinical Hypnotherapist, charges $1,500 for a custom recording and $25,000 for a one-hour private hypnotherapy session at his office. But you can get all the benefits for this low price. Simply listen to the Improve Computer Sessions Hypnosis MP3 download every night as you go to bed for three weeks and feel the changes happening in your life. You will feel more empowered, more in touch with your true self, and you will truly know that your goals are within your reach. Steve G. Jones achieves AMAZING and LASTING results!!! Hypnosis is the easiest way to affect change in your life because the positive messages go straight to your subconscious mind effortlessly so you can accomplish your goals and reach for the stars!! All you have to do is listen to the Improve Computer Sessions Hypnosis MP3 audio at night as you go to sleep!!! You’ll hear soft music, the gentle sounds of the beach, and the soothing sound of Steve G. Jones’ voice all working together to bring about positive changes in your life easily and naturally. Steve G. Jones has been helping people improve their lives with hypnosis for over 17 years…now it’s time for him to help YOU… don’t wait, do it NOW !!! you’ll be glad you did. See you at the top! And as you continue to relax deeper, deeper and more deeply relaxed, you realize that you are a relaxed when you are in front of your computer. You realize that the computer is a very powerful machine. It is able to do things in the most efficient way. You realize that you can rely on the computer to do a lot of things. You can communicate with people with a click of a button. You can access bank accounts and pay bills very quickly. Computers are a great tool that can simplify your life. It is important that you remain patient with a computer at all times. Although it does things efficiently, your mind is more complex than a computer. You realize how important a computer is to your work or how important it is to your life. You keep an open mind whenever you sit down for a computer session. Whatever it is that you sat at your computer to accomplish, realize that you have the ability patience and concentration to accomplish that task. And because you are relaxed now on the computer you can begin to realize just how much enjoyment you get from being on the computer. You are a very focused person and you enjoy time spent using the computer. When you have an idea or project that you are interested in, you are able to use the computer to do research. You are able to focus and concentrate easily on the computer. You are so relaxed on the computer, you are calm, you are peaceful. You are able work on any project you choose. You have the ability to be an excellent typist and you use this skill to write emails. You are able to block out other things and just focus on your computer session. Picture yourself sitting down in front of the computer right now. Perhaps you will use the internet, or maybe not. You become a hard worker when you set down to use your computer. You complete the work that you wanted to do and you are very efficient in how you reach each task. You are able to focus on anything you want to focus on. Day by day your abilities on the computer are increasing more and more. You are becoming more and more familiar with different programs and different sites. You are becoming very focused and you remain positive whenever you are using the computer. You are able to concentrate on anything you choose to concentrate on. And as you relax, you now imagine something you want to focus on, it can be anything at all. Imagine yourself there in the moment on the computer, focused, relaxed, concentrating, blocking out any unnecessary situations. Whether it’s work or play, you are relaxed and enjoying your computer session. Imagine yourself there, so very focused, that’s right. See yourself, see how calm you are and relaxed, see how much you are enjoying being on the computer. You are very determined, that’s right. And this is how you will be from now on when you are on the computer. I want you now to picture yourself six months from now. Imagine that you are using a computer. Look at yourself being so productive on the computer. You accomplish your goals using the computer. You are now completely proficient on your computer and you have amazing yourself with your skills. You enjoy sitting down in front of your computer and you always remain positive while doing your work or just having fun. Now, the computer represents enjoyment and productive. The computer is a great tool in your life and that feels wonderful. Learning skills on the computer is very important this day and age. As we look to the future, we are going to become more and more dependent on computers. It is important that you learn the necessary skills to keep up with the ever-expanding technology. When you sit down to the computer, it is important that you get the most out of your session as possible. The Improve Computer Sessions Hypnosis MP3 recording will help you do just that! You will be able to focus on the task at hand. The hypnotherapy session will give you the motivation and confidence to get the most out of your computer sessions. You should plan on listening to the hypnosis recording for 21 nights in a row. 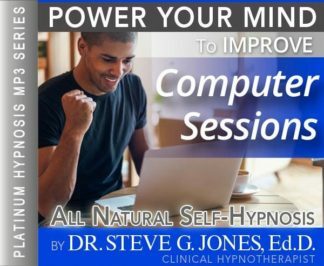 You will hear the soothing voice of Steve G. Jones as he puts you into a deep state of relaxation (hypnosis). You will then receive positive suggestions on how you can improve your computer sessions. We encourage you to listen to the recording on a weekly or monthly basis after the initial 21 nights if you wish to further your improvement.